Used Audi A6 Review - 1997-2005 | What Car? 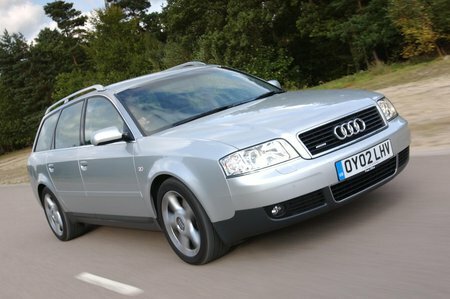 Which used Audi A6 estate should I buy? We'd buy either of the 2.5 V6 turbodiesels - so much pull always on tap, yet miserly with fuel. They came with an optional automatic gearbox, and it's worth finding one, because it works so well with the 2.5's broad-shouldered pull. The many petrol V6s are also refined and strong but can't match our favourite diesels for fuel efficiency. The 2.0 and 1.8T turbo four-cylinder petrol engines are okay, but not strong enough for towing. The 1.9 TDI (with 110, 115 or 130bhp) is the most frugal but lacks the sheer muscle of the 2.5 TDI. V8 petrol versions, including the red-hot S6 and white-hot RS6, are effortlessly fast but drink fuel at a frightening rate. All models have climate control, alloy wheels, electric windows, four airbags, traction control and anti-lock brakes. That's enough for us, but there are plusher SE, quattro and Sport models if you want to spend more.